Cactus, common name for the family comprising a peculiar group of spiny, fleshy plants native to America. The family contains about 1650 species, most of which are adapted to arid climates. The fruits of cacti are important sources of food and drink in many areas to which they are native. 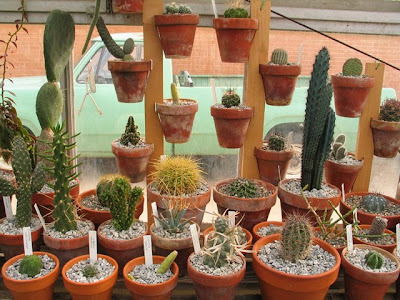 Because cacti require little care and exhibit bizarre forms, they are popular for home cultivation and are coming under increasing pressure as a result. 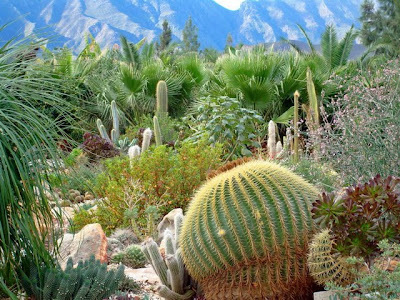 More than 17 kinds of cacti now face extinction because of plundering by avid collectors and professional poachers, especially in the southwestern United States and northern Mexico. Cactus plants usually consist of spiny stems and roots. Leaves are greatly reduced or entirely absent. Only in two genera are fully formed leaves present. The stems of cacti are usually swollen and fleshy, adapted to water storage, and many are shaped in ways that cause rain to flow directly to the root system for absorption. The roots form extensive systems near the soil surface, assuring that a given plant will absorb the maximum amount of water from a wide area; plants in deserts are usually widely spaced. The most distinctive vegetative feature of cacti is the areoles, specialized areas on the stems on which stiff, sharp spines usually grow. 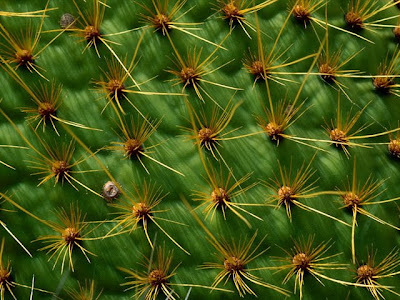 Some cacti lack spines but have hairs or sharp, barbed structures called glocids on the areoles. Areoles develop from lateral buds on the stems and appear to represent highly specialized branches. The flowers of cacti are often large and showy and occur singly rather than in clusters of several flowers. The perianth (floral tube) does not consist of sharply differentiated sepals and petals, but rather of a series of bracts (modified leaves), which gradually grade into sepals and finally into showy petals. The flowers have many stamens; the ovary is inferior and fused to the perianth. The fruits are often brightly colored and fleshy. 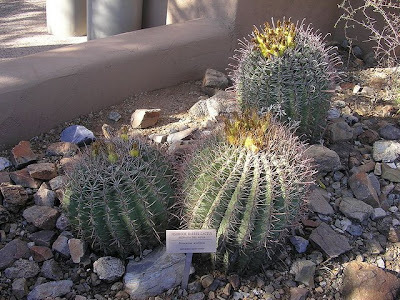 Most of the 130 or so genera of cacti are found in cultivation, the small, slow-growing species being most popular because of their variety in shapes, colors, and spines. 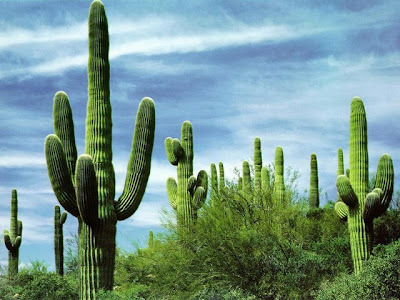 One of the best-known is a group containing beautiful night-blooming flowers and the familiar saguaro plant. In some classifications, this group is split into as many as 10 separate genera . Still more widely grown is the group containing the Christmas cactus. Species of this group, which naturally occur as epiphytes (air plants) in tropical rain forests, do not fit the popular idea of cacti as squat, fleshy plants of desert regions. 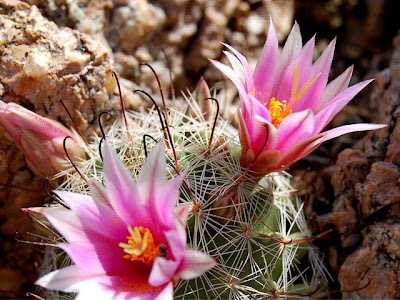 Examination of their stems, however, reveals the presence of the cactus family’s unique areoles; their flowers have the typical cactus features. Many groups of plants that are unrelated to cacti have also adapted to survive in arid regions and often resemble cacti in appearance. These offer examples of parallel evolution: Unrelated organisms subjected to similar environmental stresses often evolve similar anatomical and functional characteristics. For example, many spurges that grow in dry parts of Africa, where cacti are not found, exhibit leafless, spiny, fleshy stems . Scientific classification: Cacti make up the family Cactaceae. Cacti with fully formed leaves are classified in the genera Pereskia and Pereskiopsis. The night-blooming flowers and the saguaro plant are classified in the genus Cereus. The Christmas cactus is classified as Schlumbergera bridgesii.